Nice clear day, temps in low 70s. 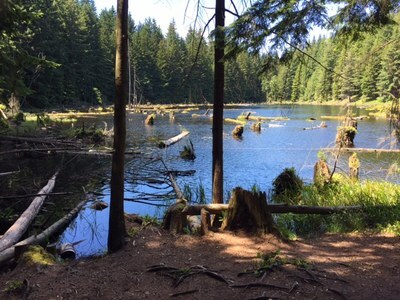 From Chuckanut Dr TH did a loop on Max's shortcut Trail, passing Lily Lake to Lizard Lake- nice lunch spot. Then visited Oyster Dome with views even better than Samish Overlook, and took the (newer) Oyster Dome Trail for return. No issues. Trails in great shape. Little running water (or mosquitos) after about 15 days dry. Water in Lizard Lake looked clear. Typical Sunday crowds on O.D. Leisurely 6.5 hour RT, 10.5 miles, 2800 feet gain.